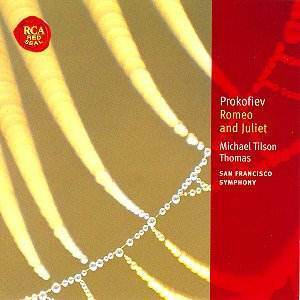 This recording was set down a fortnight after Tilson Thomas's inaugural concert with the SFSO. It makes for an outstanding representation of the ballet for collectors who would rather have a very generous sampling (29 tracks) instead of the whole thing. MTT has a great feeling for aggressive movement without scouting over emotional messages. The upward-floating moonlight of Balcony Scene (tr. 15) is portrayed in breathtaking tenderness. This is not an isolated instance either; try Madrigal (tr. 13) and 'Romeo And Juliet' (tr. 24). The spurs are applied in the pummelling wave-beat of Interlude at 26 as the brass tier call out in indomitably stentorian tones. The recording quality is exceptional with The Quarrel (tr. 4) a good demonstration track. Its antiphonal effects, darting backwards and forwards, are memorable. Delicacy is on call as well with the orchestra�s account of Juliet�s speeding tiptoes likely to impress even the most stolid listener. The spatial sense is well conveyed with the brass dazzlingly caught over a wide soundstage as in the Introduction to Act III. The success of the score depends also on the ability to juxtapose cordite and peaches. This is unflinchingly captured in �The Duke�s Command� (tr. 6). The paranoia inherent in the �Mandolin Dance� is caught with a manic wildness as never before not even by Rozhdestvensky or Algis Zuraitis (both complete sets); the latter well worth tracking down on CFP provided you are not allergic to the Soviet performing tradition. The music goes for little unless there is blaze and blare in �The Death of Tybalt� and that it gets though the effect is not quite as monumental as it can be. A healthy string glow is in evidence throughout: neither over-plush nor starveling. This is exemplified in �Juliet's Death� where, even at high pressure, the strings keep their lustre and yield rather than taking on an iron harshness. The conductor is to be congratulated for ending what amounts to an extended Romeo and Juliet �symphony� in such repose rather than in clamour.